Will there be a casino on my cruise ship? That depends on which cruise line you've chosen. Most large cruise ships, and even some of the smaller ones (Crystal's 848-passenger Crystal Symphony and 980-passenger Crystal Serenity, for example), will have an onboard casino. The major exception to the big ship rule is Disney Cruise Line, which does not have a casino on any of its four cruise ships. 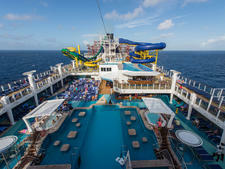 Norwegian Cruise Line's Pride of America also does not have a casino. Most expedition ships and river boats do not have casinos. What types of machines and/or tables will I find in the casino? All cruise ship casinos have numerous slot machine options, and most have table games as well, including blackjack and a variety of poker games (Ultimate Texas Hold'em, Caribbean Stud, Three Card, Let It Ride) that you play against the dealer. For Texas Hold'em played against other players, some ships will have dealer-dealt tables (Norwegian Cruise Line, most Royal Caribbean ships), while others will use electronic Poker Pro tables (Carnival Cruise Line, Princess Cruises). 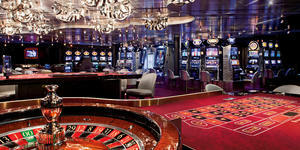 Still other ships will not offer Texas Hold'em at all; Silversea doesn't offer poker of any variety. There's usually also at least one roulette table and one craps table, and a rare few will have Baccarat. 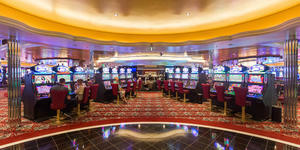 Are there penny slots in a cruise ship casino? Yes, every cruise ship casino has penny slots. But they offer so many variations of ways to win that, at 1 cent per variation, your 1 cent bet can easily end up costing you more than $2 a go. Are there high stakes tables in a cruise ship casino? Very few cruise ships offer truly high stakes gambling. On some ships, like select Royal Caribbean ships, if enough high rollers want to play a high stakes game, the pit boss may arrange a game. But for the most part, tables are limited. Are there poker, blackjack or slot tournaments in the casino? 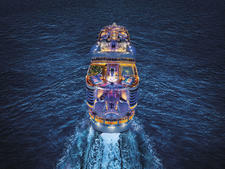 Most cruise ships with a casino will offer tournaments of some kind. Most common are slot and blackjack. Most tournaments are buy-ins where you pay a certain amount to enter and then don't actually spend money during the tournament. Some cruise lines allow you to rebuy during blackjack and poker tournaments, so winners tend to be whichever player is willing to continually rebuy. Winners of tournaments typically win money but on some ships, namely Royal Caribbean, winners of the Texas Hold'em tournament are also eligible to receive a free cruise for two on which the final Royal Poker Tournament is held, for which a prize pool of $100,000 is guaranteed. Is the cruise ship casino open 24/7? No. Cruise ship casinos are only open when the ship is out to sea or in port in a select few countries where gambling is permitted (at least on the cruise ship), such as Bermuda and Malta. On some cruise ships, casinos are also closed during the day -- even when the ship is out to sea because cruise lines know most people are doing other things during daylight hours. Night hours vary, but cruise ship casinos tend to stay open until 2 or 3 a.m. Always check your daily cruise schedule for the day's casino hours. What is the minimum age to play or hang out in the casino? On most cruise ships, the minimum age to be in the casino is 18. 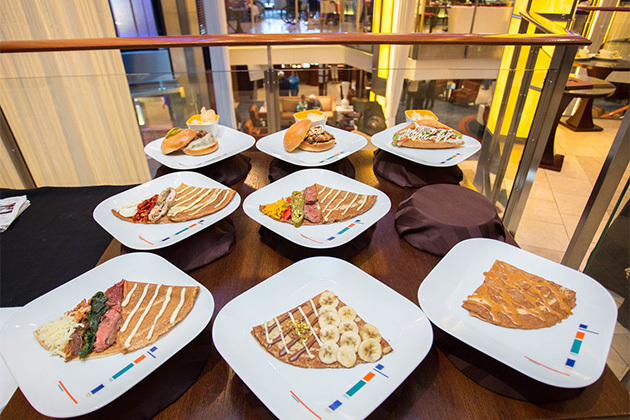 Royal Caribbean, Celebrity and Azamara raise that age to 21 on sailings in Alaska, while MSC raises it to 21 in the Caribbean. Princess Cruises, Windstar and Seabourn Cruises are among the few lines that require passengers to be 21 in the casinos on all sailings. In many cases, casinos are located along main thoroughfares, so kids will be walking through although they're not supposed to linger. 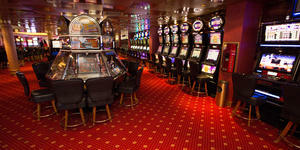 If you wish to gamble, but think you might be too young, check with your travel agent or the cruise line before booking. Can I use cash in the casino, or is everything charged on my cruise card? 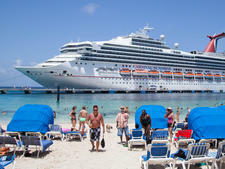 On most cruises, you'll be able to use both cash and your cruise card. At the tables, your cash will be turned into chips or you can charge the price of the chips on your cruise card. 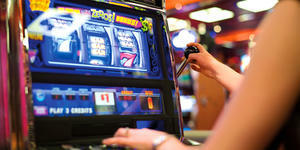 Most slot machines will just take your cruise card, but some will also take cash. Very few cruise ship casinos are cash-only but a few do exist. (Windstar and Silversea are examples.) Though most big ships will have an ATM, the fee to withdraw money is usually pretty high; bring some bills if you're unsure of how the casino on your chosen ship works. Drinks are only free in casinos on ships where drinks are always free, such as luxury lines including Crystal, Silversea and Regent. On most ships, you'll have to pay for your drinks just like you do at the bar or in the dining room. Pit bosses do have the authority to buy a round for the table a couple of times a night, so make friends with the pit boss if you can. If you're a member of a cruise ship's casino loyalty program and have racked up enough points, you might earn free drinks but most programs require you to bet a significant amount of money before all drinks are on the house. Is there a casino loyalty club through which I can earn points and perks? 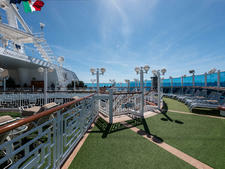 Most big ship casinos offer a loyalty program that is separate from the general cruise line loyalty program. As you bet money, you earn points toward rewards, usually free drinks and cruise sailings. You have to bet a lot of money to rack up a significant number of points, so don't gamble in the casino just to try and earn rewards; you'll end up spending more money than the reward is worth. The rewards you earn on one cruise ship do not always transfer to another ship, even within the same fleet. If earning casino points on multiple cruise ships is important to you, check with the cruise line ahead of time to get specific rules of the casino loyalty program. Can I smoke in the casino? Again, this depends on the cruise line. Most of the big ships allow smoking in the casino; some, like Carnival, have smoke-free sections (Norwegian Bliss is also the only Norwegian ship whose casino has a separate room for smokers). Ships that do not permit smoking in the casino at all include Celebrity, Crystal, Cunard, Oceania, Regent Seven Seas, Seabourn, Silversea and Windstar. Find out more about cruise ship smoking policies. How can I find out more about cruise ship casinos?